Before pinning a stack, press each layer separately. You can use steam or not, as you prefer. I recommend using Magic Sizing® or other spray sizing to help remove wrinkles and to stablize the grain. Stack all the layers right side up, with the selvages together. 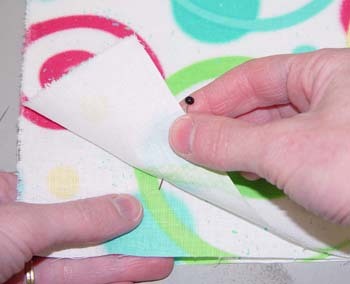 To stick-pin the layers, select a point on the fabric design that is about 1"- 1 1/2" from the crosswise (cut) edge. Look for something that's easy to spot, such as the tip of a leaf. Place the point of a pin through this spot. Lift the top layer of fabric and slide the pin through. Find the same point on the next layer and slide the pin through it. Continue lifting layers and pinning through this point until you have gone through all the layers. Slide the pin all the way through to the head and hold it in place with your thumb and forefinger. 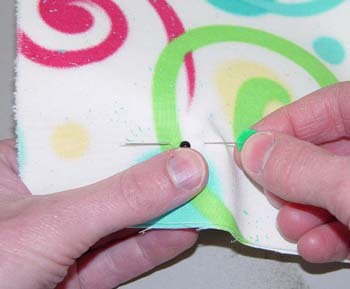 Hold the pin straight up and down and smooth out the surrounding fabric. Use a flat (flower-head) pin to pin through all the layers, right beside the stick pin. The flat pin should run parallel to the edge- that is, it should point in the same direction that you'll be cutting the strips. That way, it will be less in the way of the cutter. Remove the stick pin. Repeat the pinning process at several other points across the edge of the stack, approximately 6" apart . For additional accuracy, also pin along the selvage and torn edge, about 8"-12" up on each side. You can also use the MicroStitch (tm) Tool to tack your stack, in place of pins.